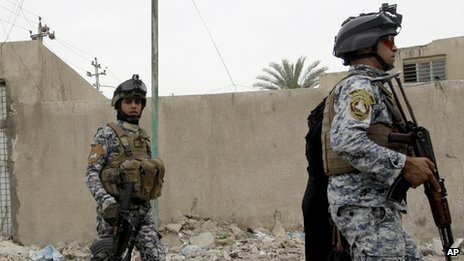 Hundreds of inmates have escaped from two Iraqi prisons after gunmen stormed two jails near Baghdad. Fighting raged for several hours after the jails – Abu Ghraib to the west of the capital and Taji to the north – came under attack. Mortar fire and suicide bombs were used to gain access to the jails, whose inmates include al-Qaeda prisoners. At least 20 members of the security forces were killed as they struggled to regain control. A senior Iraqi MP, Hakim Al-Zamili, said that about 500 prisoners had escaped from the notorious Abu Ghraib prison. Most of them were senior members of al-Qaeda who had been sentenced to death, he told Reuters news agency. “It’s obviously a terrorist attack carried out by al-Qaeda to free convicted terrorists with al-Qaeda,” the agency quoted an unnamed security official as saying. Abu Ghraib was used to torture opponents of the regime during Saddam Hussein’s rule, and its infamy increased in 2004 when photographs were published showing detainees being abused by US guards. The prison attacks were launched at about 21:30 (18:30 GMT) on Sunday night. Gunmen fired mortar rounds at the prisons, and then used car bombs at the entrances. The situation was eventually brought back under control on Monday morning, with the use of military helicopters. The Iraqi authorities initially said that the attackers had failed to free the prisoners in Taji and Abu Ghraib. They said security forces reacted quickly enough to seal the area and cut off any escape route. But it quickly emerged that they were wrong, as reports came out that at least 500 prisoners had indeed managed to escape. The government had to admit that “some” prisoners had escaped, without saying how many. In the past, several attacks on prisons have resulted in dozens of inmates being freed, as well as records and precious information about them being destroyed or stolen. In Mosul, too, the army took a painful hit, another reminder that the northern city remains one of the most dangerous for security forces in Iraq. It is not just Mosul, however, and not just the security forces that are suffering. Continuous waves of attacks across the country have exposed the government’s chronic failure to secure the country. Iraqi authorities initially denied any prisoners had escaped in the attacks, but now acknowledge “some” prisoners escaped. The Interior Minister, Wissam al-Firaiji, said the attackers, who he called “terrorists,” had been well-armed. “The attack against Taji jail alone was carried out by nine suicide bombers and three car bombs driven by suicide bombers,” he told reporters. Elsewhere in Iraq, two attacks on security forces in the northern city of Mosul killed 33 people, officials said. A man drove a vehicle packed with explosives up to a military convoy. “A suicide bomber was following the convoy and when it stopped in the middle of road he detonated his vehicle right behind it,” a policeman told Reuters news agency. A group of soldiers and at least two passers-by were among the dead, officials said. A second attack was launched on a group of policemen, several of whom were killed when gunmen stormed their checkpoint. Mosul, 360km (220 miles) north-west of Baghdad, is one of Iraq’s major flashpoints. Insurgent groups such as al-Qaeda have found the city a fertile recruiting ground. It is the capital of the Sunni-dominated Nineveh province, and many Iraqi Sunnis resent the Shia-led government, correspondents say. It is unclear who was behind the incidents, but there has been a recent escalation in violence across Iraq. More than 200 people have been killed since the start of the Muslim holy month of Ramadan, and 2,500 Iraqis have died in violent attacks since April, according to UN figures released this month.